The effects of budget deficits on economic growth is an important topic in macroeconomic analysis of tax policy. Some economic theories suggest that budget deficits reduce growth by increasing interest rates and diverting private saving from investment to government debt. It has been hard to find an empirical link between deficits and increased interest rates or reduced investment in practice. Interest rates have, in fact, remained low for many years, even as deficits were high. Theories about deficits and investment should be reexamined to consider the implications of a large global supply of savings. An important topic in dynamic modeling of tax policy is the effect of government deficits on the economy. Changes in tax revenue are often considered in tandem with commensurate increases or decreases in spending. However, when a tax increase or decrease is enacted without a commensurate increase or decrease in spending, the legislation has an effect on budget deficits or surpluses. It is valuable to lawmakers to use the tools of macroeconomic analysis in order to find out what effects these deficits or surpluses may have. Some economic theory posits a relationship between deficits, interest rates, and private investment. This issue matters because investment raises productivity and overall economic output. If government deficits do indeed have an effect on private investment, they can be a determinant of economic growth. This paper will address theories about that relationship. 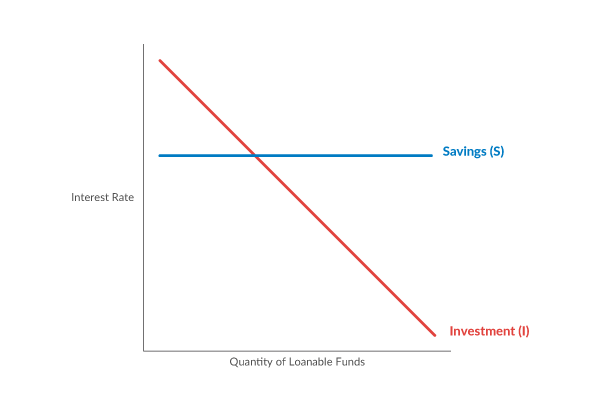 What this means is simply that saving, S, is used to fund investment, I. For example, people could put their money in a bank, which lends to a real estate firm, which uses the money to construct a new office building. Without the saving, the office building would not have been possible. When government spending,G, is more than tax revenue, T, the government runs budget deficits. Deficits create new debt, which must be purchased by private individuals or institutions. So some private saving is taken to fund government debt, leaving less to fund private investment. When individuals acquire government bonds, they have saved, and become richer. However, unlike the previous example, the purchase of government bonds does not result in the construction of new office buildings or other private investment. Instead, it simply creates a new paper asset, but no physical investment. If we imagine that saving remains constant, then any cut in taxes (without a cut in government spending) reduces investment: money that would have been lent to the real estate firm to build new office buildings is instead lent to the government. This simple framework is often used to show what happens with larger government deficits. As government borrows more, it uses some loanable funds from savers, making them scarcer for private investors. As a result, lenders can demand higher interest rates, and fewer investments get made. The effects of the higher government deficit come out partly in the form of reduced investment, but also partly in the form of higher interest rates and increased saving. 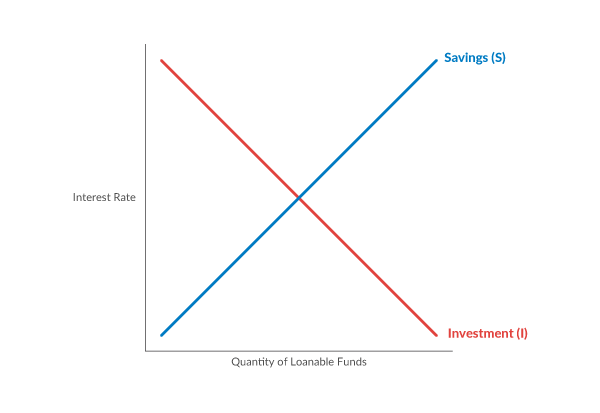 In a model with a loanable funds graph, deficits don’t fully crowd out investment. However, they do reduce it. If this model accurately describes the world, then deficits undoubtedly create a drag on growth. This is what some economists call the “crowding out effect.” This theoretical framework is used by some economists in macroeconomic analysis of changes in fiscal policy by the federal government. Both the Congressional Budget Office (CBO) and the Joint Committee on Taxation (JCT) use this theory to strong effect in their macroeconomic analysis of legislation. For example, a recent analysis from JCT studied a bill on a tax provision called “bonus depreciation,” which increased deficits by $280.6 billion without any economic effects. JCT found that the economic growth produced by the provision would reduce its effect on the deficit by $13.7 billion over a 10 year period. It also reported that the macroeconomic growth effects would have resulted in $30.7 billion of deficit reduction if not for increased outlays due to rising interest rates. Additionally, the analysis states that in later years, “the bill is expected to result in continuing increases in Federal debt, it is expected to make private borrowing more expensive, reducing investment incentives.” This is precisely the economic model described above, in which deficits lead to higher interest rates and lower investment. In the long term, the most important economic effect of such policies in this analysis comes from changes in the amount of federal debt held by the public. Over time, lower federal debt leaves more funds available for private investment and thereby causes output to be higher than it would be otherwise. Higher federal debt has the opposite effect, “crowding out” private investment and decreasing output. In other words, a “crowding out” effect is included in models used at places like the CBO and JCT. Its presumed magnitude is notable enough that it is a significant part of the analysis of many bills introduced in Congress, and it is even the most significant effect in the very long term. A worthwhile question then, is whether this effect is justified in its large role in macroeconomic analysis of federal policy. In the past, economists have found some empirical evidence for the crowding out theory, but the effect was generally seen to be small. For example, Eric Engen and Glenn Hubbard in 2004 found that an increase in debt equal to one percent of GDP would increase interest rates by only about three hundredths of a percent. Under some assumptions, the number could be larger than that, though under others, it became statistically insignificant. The foregoing sampling of recent econometric tests of the effect of real Federal deficits on real interest rates indicates that empirical studies of the issue are inconclusive. Although theoretically sound research has at times identified the crowding out effect, the result is not persistent across time and across different methods of study. For example, in recent years, the study of crowding out has been virtually abandoned. One reason for this is that the effect simply hasn’t existed over the past seven years. If anything, in recent years, budget deficits are associated with low interest rates, not high ones. As the recession hit in 2009 and the budget deficit reached a historic high, interest rates plunged to new lows. This is the opposite of what a crowding out theory would predict. Paul Krugman noted this phenomenon in 2009. He explained, “a weak economy both drives up deficits and drives down the demand for funds, while a strong economy does the reverse.” He considered the association between borrowing and high interest rates a “falsity,” at least under the depressed economic conditions of the time. Under standard macroeconomic theory, government deficits when the economy is depressed can boost economic output and incomes. With higher incomes, the private sector may able to both afford to purchase the new government debt and still fund as much investment as it did before. Even without a large output gap, though, with the improving economy of 2013 and 2014, the relationship has not really materialized. Low interest rates have become the norm. Even as overall economic conditions have picked up substantially, and even as projected deficits remained elevated, higher interest rates are nowhere in sight. The federal government has repeatedly predicted rising interest rates in its budget forecasts, but those rising interest rates have not materialized. There are reasons to believe deficits raise interest rates under some circumstances. We may have seen this in the past, especially in earlier times when international capital flows may have been smaller. However, in recent times, we have not observed the connection, which suggests that the crowding out model is deserving of some reexamination. 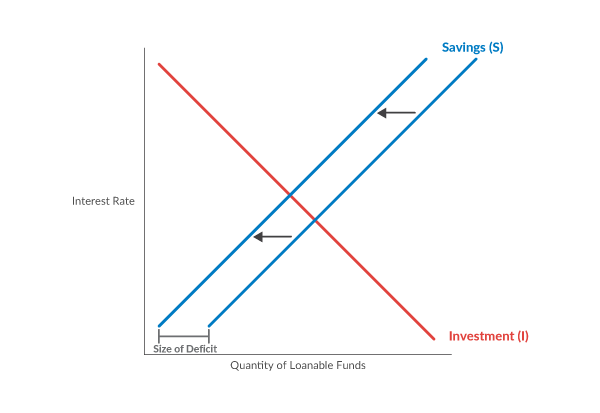 One substantial drawback with the simple framework sketched above is that it assumes that saving behavior at a given interest rate does not change as taxes or deficits change. This is highly unrealistic. Consider an increase in taxes, for example. The assumption that S (saving) does not change if T (tax) rises is an assumption that the entire tax increase comes out of consumption. This is not likely. Faced with lower after-tax incomes, people are likely to reduce both their current expenditures and their saving. Conversely, if taxes were decreased, people would have higher after-tax incomes, allowing them to increase both their expenditures and their saving at any given interest rate. Simply put, the effects of the tax changes themselves can go a long way toward muting “crowding out” effects. This is not the only mechanism that could counteract crowding out effects. Foreign capital flows are another part of the story. A slightly more elaborate version of the model that relates interest rates and investment takes account of the fact that the United States is an open economy, meaning that investment can actually be funded by savers from abroad. Sometimes, the equations describing the savings identity are written to include net capital inflows, which are equal to the surplus of imports, M, over exports, X. In this case, an increase in desired domestic investment can also be funded through a capital inflow equal to an increase in net imports. Foreigners sell additional goods to the United States, and in exchange, they take ownership of domestic financial assets, such as government bonds. In this case, domestic savers are no longer needed to fund the increase in the deficit, and foreigners can make up the difference. However, even in the absence of foreign savers purchasing new U.S. financial assets, there is still another possibility that may dampen the crowding out effect: there could also be a reduction in lending by U.S. individuals and institutions to foreign borrowers, with the U.S. saving redirected to purchases of U.S. government debt or domestic investment. In other words, the U.S. does not need to save more in total in order to fund more private investment and government deficits; it only needs to repurpose its domestic saving toward domestic purposes. The availability of foreign capital flows substantially changes the analysis. If one assumes the world is a very large place with many savers across many continents, then perhaps the loanable funds graph used above looks different. In an increasingly global market, there might be a broad and deep pool of lenders from which to borrow. 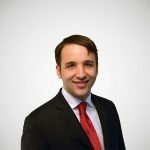 When he looks at global markets, he sees an excess of desired saving around the world, making it easy to borrow and invest at low rates in very large quantities. As a central banker, he was attempting to explain low interest rates, and his explanation was the broad supply of loanable funds. Bernanke has since, 10 years later, updated his views on the phenomenon in a blog post at Brookings. He concluded that “the global savings glut hypothesis remains a useful perspective for understanding recent developments,” in part because demand for safe assets by Europeans had increased. With a flat curve, the supply of loanable funds is determined by global conditions like the ones Bernanke mentioned in Europe, not local conditions like the details of specific spending bills in the United States. With a large and elastic supply of loanable funds, an increase in demand from a single open economy does not necessarily raise interest rates, in that country or elsewhere. The CBO’s methodology for handling this issue does in fact take into account foreign capital flows from abroad,  but not to the degree that a “global savings glut” hypothesis or the empirical data of the last few years would seem to imply. Its estimates of the responsiveness of interest rates to deficits seems more in tune with pre-recession estimates than with recent experience. It is likely that the global recession, the presence of liquidity traps in many countries, and increasingly connected and liquid financial markets have resulted in a situation where the supply of loanable funds is deeper and broader than old conventional wisdom suggests. The CBO bases its assumptions on the best consensus of economic literature, but the consensus of economists on interest rates has developed substantially in the last 10 years. Much of the literature on interest rates in recent years has been on why interest rates are so low, why they are failing to rise, and what can be done to reverse the trend. Recent experience has simply changed the calculus on this particular issue. Over the long run, budgets are certainly constrained; debt cannot rise forever as a share of GDP, nor can debt service be allowed to take up ever-increasing amounts of federal revenue. Over time, taxes and spending need to be roughly in balance. However, over the short run, tax reduction proposals that increase incentives to save and invest, even if they modestly increase the deficit, seem unlikely to substantially drain the supply of loanable funds, increase interest rates, or seriously impede investment. “A Report to the Congressional Budget Office of the Macroeconomic Effects of H.R. 2510, ‘Bonus Depreciation Modified and Made Permanent,’ as Ordered to Be Reported by the House Committee on Ways and Means.” Joint Committee on Taxation. October 27, 2015. https://www.jct.gov/publications.html?func=startdown&id=4844. “Budgetary and Economic Outcomes Under Paths for Federal Revenues and Noninterest Spending Specified by Chairman Ryan.” Congressional Budget Office. April 2014. Engen, Eric, and R. Glenn Hubbard. “Federal Government Debt and Interest Rates.” NBER Working Paper No. 10681. August 2004. http://www.nber.org/papers/w10681. “The Effect of Deficits on Prices of Financial Assets: Theory and Evidence.” Department of the Treasury. March 1984. https://www.treasury.gov/resource-center/economic-policy/Documents/deficits_base.pdf. Krugman, Paul. “Deficits and interest rates.” August 14, 2009. http://krugman.blogs.nytimes.com/2009/08/14/deficits-and-interest-rates/. Bernanke, Ben. “The Global Saving Glut and the U.S. Current Account Deficit.” March 10, 2005. http://www.federalreserve.gov/boarddocs/speeches/2005/200503102/. Bernanke, Ben. “Why are interest rates so low, part 3: The Global Savings Glut.” April 1, 2015. http://www.brookings.edu/blogs/ben-bernanke/posts/2015/04/01-why-interest-rates-low-global-savings-glut. Huntley, Jonathan. “The Long-Run Effects of Federal Budget Deficits on National Saving and Private Domestic Investment.” Congressional Budget Office. February 2014. https://www.cbo.gov/sites/default/files/113th-congress-2013-2014/workingpaper/45140-NSPDI_workingPaper_1.pdf. Summers, Lawrence. “U.S. Economic Prospects: Secular Stagnation, Hysteresis, and the Zero Lower Bound.” February 24, 2014. http://larrysummers.com/wp-content/uploads/2014/06/NABE-speech-Lawrence-H.-Summers1.pdf.